Amazon sure knows how to create a frenzy. The most recent frenzy had nothing to do with a product or sale. Instead, it was a flurry of activity from cities and states eager to land Amazon’s next headquarters, dubbed HQ2. 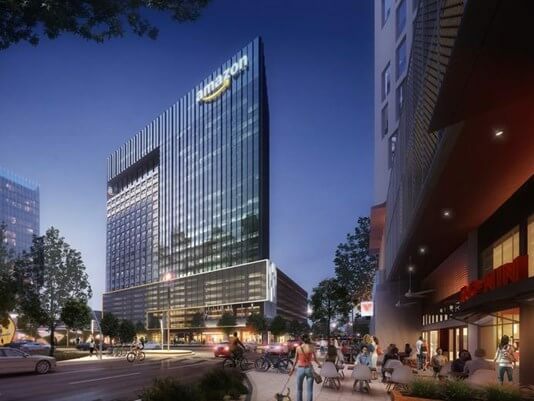 The Seattle-based retail giant made a surprise announcement in September that it was on the hunt for a new $5 billion headquarters. Rather than taking an under-the-radar approach and scouting individual locations, Amazon took a different approach: executives released an RFP detailing specific criteria for HQ2 and then asked government officials to put their best sites forward. Boston was immediately considered a front runner. It checks many of the RFP’s top criteria: a metropolitan area with more than one million people, a stable and business-friendly environment, a location with the ability to attract and retain talent, and communities that think big and creatively when considering locations and real estate options. But Boston faces stiff competition. Amazon received a staggering 238 applications in total. What’s more, the Governor’s office did not specify a preferred site in Boston. Instead, the Governor’s office submitted an application outlining 26 potential sites across the Commonwealth. Those sites run the gamut, from a number of sites in Greater Boston to a regional application in Merrimack Valley. Even Western MA got in on the action, with Pittsfield and Lee named as potential locations. That said, based on what we know about Amazon’s preferences, Boston is the state’s most competitive applicant for HQ2. The city’s robust tech cluster, innovation economy, universities, talent, and transit access put it leaps and bounds ahead of farther-flung applications. “Our universities provide the intellectual infrastructure — the ideas, solutions, technologies and talent that fuel growth, and attract startups and established companies — that makes our region a competitive place for Amazon’s next venture,” Harvard President Drew Faust wrote in a letter of support for Boston’s bid. Finding a suitable location in Boston won’t be easy. Amazon has projected needing upwards of 8 million square feet of commercial space for HQ2, though that could be built in phases over a number of years. Boston is already pretty developed, so where would HQ2 possibly go? Boston’s preference would be Suffolk Downs, a former racetrack located in East Boston. There have been several attempts to redevelop Suffolk Downs in the past, including a failed bid for a Boston-area casino a few years ago. The vacant track might be a great site for Amazon, though. It’s relatively flat, has ample parking, and could accommodate 8 million square feet of development built through 2027. It’s also well-served by public transit, with two Blue Line connections that easily connect riders with Logan Airport. “It’s the perfect site. I’d put it up against any site in the country,” John Barros, the city’s chief of economic development, told WBUR radio. Another option is the South Boston Waterfront (a/k/a the Seaport District), an area that has experienced tremendous growth over the past decade. Several companies have moved to the Seaport District in recent years, including General Electric and Reebok. Amazon should be familiar with the area, as it too has an office in the Seaport District. An influx of new housing and retail will only strengthen the appeal of the Seaport District moving forward. A less intuitive location is the Harrison Albany Corridor, which is bounded by the South End, Back Bay, Roxbury and Widett Circle. The Harrison Albany Corridor has a combination of industrial land and mixed-use development opportunities that could be appealing for Amazon, particularly if the company wants HQ2 to be more integrated into the city than a giant, standalone campus. Finally, Boston has pitched the “Allston/Brighton to South Station Corridor,” a corridor that has lots of potential and is experiencing some solid growth. Four options. Four opportunities to land the 50,000 jobs that HQ2 promises to bring. Meanwhile, the City of Somerville has pitched a regional application spanning the Orange Line, from North Station in Boston to Cambridge Crossing (formerly NorthPoint), through Sullivan Square in Charlestown and landing at Assembly Row in Somerville. This linear approach offers Amazon some of the most shovel-ready development sites. Several parcels along this route are already permitted and ready to begin construction. It remains to be seen what direction Amazon will go. Applications came in from 43 states and 11 assorted provinces, territories and districts, including Washington, D.C. Amazon plans to announce its decision sometime in 2018. If HQ2 lands in Boston, or anywhere in the surrounding area (Somerville, Cambridge, etc. ), there’s no question it will have a major impact on local real estate. The Boston area is already struggling with a housing shortage. In fact, some have said Boston’s greatest weakness in its HQ2 bid is how expensive it is to live here. Adding 50,000 new employees will only exacerbate the situation. If Amazon decides to go for Boston’s preferred location at Suffolk Downs, it will undoubtedly transform East Boston – a neighborhood that’s already in transition. The Orient Heights neighborhood, in particular, might feel pressure. A few residents in the traditionally blue-collar, family-oriented neighborhood have already spoken out against the idea of Amazon setting up shop at Suffolk Downs. However, most people in the neighboring surrounding areas have supported it, saying it will help increase property values, and begin a resurgence of businesses and construction to stimulate even more jobs and prosperity. That jobs are always good and that prosperity and upward mobility occur through quality jobs and it’s multiplier effects of skilled labor gaining more skills. Regardless of location, rental values are likely to surge. Just look what happened in Seattle. In the seven years since Amazon decided to cluster its headquarters in Seattle’s South Union neighborhood, home prices have surged by 83% and rents by 47%, according to Zillow. Earlier this year, the median home price in one of Seattle’s neighborhoods eclipsed $1 million – it was the first time that median values in any Seattle neighborhood or surrounding suburb had tipped the million-dollar mark. Despite the recent construction boom, the Boston region is notoriously slow in permitting new housing. If Amazon picks Boston, we simply won’t be able to build enough new housing units in time to accommodate the spike in demand. So no matter which neighborhood Amazon chooses, prices are bound to rise. A similar backlog of permits is one of the reasons Seattle’s housing prices have risen so rapidly. “Developers are eager to go but end up delayed for months because of delays in the city government,” says Matt Goyer, a Seattle-based real estate broker. If Boston lands HQ2, it might very well be the impetus the city needs to streamline its permitting processes. The prospect of landing such a giant employer is exciting for Boston. We’ll continue to monitor competition for HQ2 as it develops, and will share any additional information with readers as it comes our way.